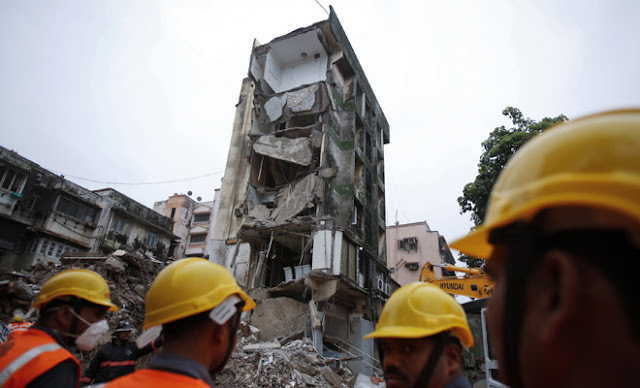 Emergency services struggled to reach dozens of people trapped after a condemned building collapsed in Mumbai on Thursday morning, killing at least 21 others. In the days before the incident, torrential rainfall had pounded India's financial capital during an unusually strong monsoon season, which has left more than 1,200 dead across India, Nepal, and Bangladesh. Despite the city declaring the building unsafe in 2011, 50 percent of residents - including several families - still lived in the 117-year-old five-story building in the Bhendi Bazar area of India's financial capital, local lawmaker Amin Patel told the Indian Express. While emergency services responded quickly to a call at 8.30 a.m. local time, the narrow streets and closely packed buildings - some of them also over a century old - are hampering rescue efforts, the Hindustan Times reports. So far, firefighters have rescued 34 people from the rubble, but a number of other residents still remain unaccounted for. Buildings often collapse during monsoon season in India, and five inches of rain had fallen in Mumbai on Tuesday, leaving streets in the area flooded and weakening the foundations of thousands of century-old buildings in the city. Meanwhile the torrential monsoon rains paralyzed India's financial capital Mumbai for a third day Thursday as the streets turned into rivers and people waded through waist-deep waters. By Thursday the city had received almost 300mm of torrential rain in the last four days, reported the Hindustan Times. Public transport stopped and thousands of commuters were stranded in their offices overnight. Since its start this year devastating floods have killed more than 1,000 people across South Asia and affected close to 40 million in northern India, southern Nepal and northern Bangladesh. The rains have led to wide-scale flooding in a broad arc stretching across the Himalayan foothills in the three countries, causing landslides, damaging roads and electric towers and washing away tens of thousands of homes and vast swathes of farmland, Associated Press reported. The UK's Guardian reported that the storm reached Pakistan on Thursday, lashing the port city of Karachi. Local TV footage showed streets were already submerged as the country's meteorological department forecast that the rains would continue for three days in various parts of Sindh province, where authorities closed schools as a precaution. Windstorms and rain are also expected in the south-western Baluchistan and eastern Punjab provinces.